This hotel was a pleasure to stay at and we only regretted that we had to be in and out so quickly, and it was only a quick 5 minute drive to the airport. Beautiful, quality towels & amenities, clean, full and delicious breakfast. No separation of lave from bed area, so light shone on sleeper. Free appetizers and breakfast, free in room high speed. Vacuuming around the edges was not done well. 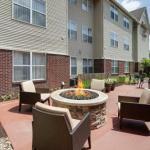 A great place to stay when visiting Indianapolis. The staff tries to accommodate your every desire. Too popular - multiple sports teams were running and talking. The pet-friendly Residence Inn Indianapolis Airport is half-a-mile from the international airport and provides a complimentary shuttle. Other items included in the room rate at this three-story, non-smoking hotel are a hot breakfast, social hours on Monday through Wednesday evenings, high-speed Internet access, local telephone calls, parking and coffee available in the lobby 24/7. The hotel comprises 95 suites each with fully equipped kitchens and separate living and sleeping areas. There is one meeting room available for business or social functions that can accommodate 10 guests. Area landmarks and attractions include three golf courses, the Indiana Convention Center, Lucas Oil Stadium, home of the Indianapolis Colts, Indianapolis Motor Speedway, the Indiana State Museum, Indianapolis Zoo and shopping at Fashion Mall At Keystone, Clay Terrace, Castleton Square and Circle Centre Malls. The suites have a fully equipped kitchen with a conventional oven and microwave oven, stovetop, refrigerator with icemaker, dishwasher, coffeemaker, toaster, toaster oven and a full set of cutlery and crockery. There is a work desk with high-speed Internet access, telephone with voicemail, television with cable movie and news channels, pay-per-view movies, pullout sofa bed, hairdryer, alarm clock and an iron and ironing board. Some of the two-bedroom suites have a fireplace. Video games and players are available for rent. This inn has an indoor swimming pool, whirlpool, fitness center and a sport court. There is a grocery shopping service and the inn has a list of restaurants that will deliver to the property. Places to eat nearby include Ricks Boatyard Café, Dennys, Indys and The Library Steakhouse. The 24-hour front desk has safe deposit boxes and information on area events and attractions. Other amenities include copy and fax services, a coin-operated laundry, valet dry-cleaning, picnic area with a barbecue grill and a gift shop and newsstand. Several guests at this Residence Inn said that the staff at this hotel really care  and the results show. The suites are very clean, the breakfast items are hot and freshly cooked and if there are problems they are handled promptly and with a smile. Most visitors said there was noise from the nearby airport but it was not enough to stop them having a good nights sleep on comfortable beds. The majority of clients say they would use this property again and had no problem in recommending the hotel to others.